Through the wonders of technology, we are all invited to stand alongside Jane Austen at an art exhibit she attended on May 24, 1813–two hundred years ago. The date was just a few months after the publication of Pride and Prejudice. 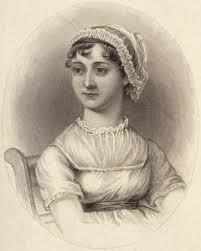 Jane mischievously told her companions that she fully expected to see her heroine, Elizabeth Bennet, in a portrait. Elizabeth had just become Mrs. Darcy, of course. “I dare say Mrs. D. will be in yellow,” Jane wrote to her sister. The exhibit was a retrospective of work by Sir Joshua Reynolds, who had been painting the rich and famous for decades. In 1769 he was knighted by King George III, who appreciated the “Grand Style” in which Reynolds painted his mostly wealthy subjects. When he painted unnamed allegorical or mythological figures, the models tended to be rich and/or famous, and everyone knew who they were. As it happened, Jane did not find a likely image of Elizabeth. She joked later that surely Reynolds had painted her, but Mr. Darcy must have valued the portrait too much to put it on public display. Jane did, however, enjoy mingling with the celebrities who crowded the exhibit. We could think of this exhibit as the very first edition of the tabloids we all see in grocery checkout lanes (and read as a guilty pleasure). Everyone who was anyone wanted to fall under the gaze of Reynolds, just as our celebrities hire publicists to get themselves on the covers of magazines. 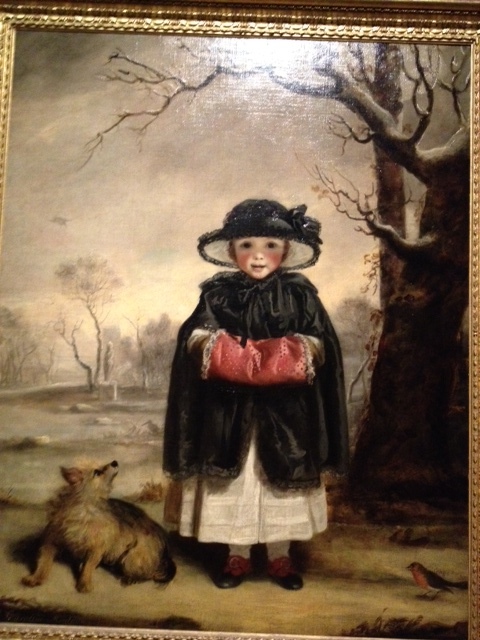 Sir Joshua Reynolds was also renowned for tender portraits of children. My very first post described one of my favorite paintings by Joshua Reynolds, “Lady Caroline Scott as Winter,” painted in 1776. The post is at https://castlesandcoffeehouses.com/2012/11/20/winter-as-a-child/. ‎The portrait is in private hands, but I saw it in a special exhibit at the Vienna Kunsthistorisches Museum two years ago. This child was an exact contemporary of Jane Austen. I like to imagine that Lady Caroline attended the same exhibit, and maybe rubbed shoulders with Jane. We tend to think of Jane Austen as a country mouse, a spinster who spent her days waiting on her family and shyly writing her novels in secret, in her spare time. Actually, she was fun-loving, always ready for a dance or an outing. She knew all about balls and country homes because she attended many balls, large and small. And she had relatives with grand country homes. To enter the exhibit, go to www.whatjanesaw.org/. The complete original catalog of the exhibit is there. If you click on a picture, an enlargement comes up, along with a description. If you have trouble getting into the site, go to the article below and click on the link. Historians at the University of Texas at Austin meticulously recreated the original exhibit, using accurate historical sources. So we can see the arrangement of the actual paintings in the 3 rooms of the exhibit. We can try to imagine Jane’s assessment of each painting–I’m hearing pithy comments, aren’t you? Join me next time for more exploration into the art and history of Europe and the British Isles, with some detours into literature too! This entry was posted in Art, British Isles, England and tagged ", " University of Texas at Austin, "What Jane Saw, "Winter as a Child, Elizabeth Bennet, Jane Austen, King George III, Lady Caroline Scott as Winter, Mrs. Darcy, Pride and Prejudice, Sir Joshua Reynolds on June 1, 2013 by Claudia Suzan Carley.